I could loot this item as a level 100 while it offers a level 120 Quest. after i heartstoned to orgrimmar, i got the quest for this item! This item starts A Child of Pa'ku quest. You need to be 120 level to start a questchain from Pterrordax Egg. /way 67.13 46.46 Pterror Rise road starts. This quest is part of the Zuldazar How to Ptrain Your Pterrordax questchain. Spent about 20 minutes each killing Bloodraged Pterrordax and Pterrordax Skyrenders, no drop. If it still drops from these guys, it might be at a different drop rate. 2. The droprate is absolutely abysmal and this mount will be really rare. The first guess is backed up by the fact that you can't see the mount on the journal (although this can happen with other mounts, too). Friend just had this drop for him while doing a world quest in Nazmir, so can confirm it does still drop. 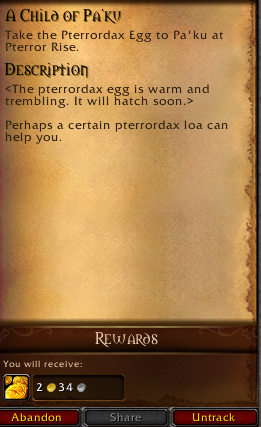 Perhaps it's been changed to be associated with this quest, like the falcosaur hatchlings in Legion? the droprate is horrible.... farmed a lot, still no drop..
Farmed 5 minutes Pterrordax Skyrender while also having the quests there and got it. Also shared it with my friend and he got an egg too. I just got this item from a Bloodraged pterrordax, i am lvl 120 and i have the pa'ku loa selected which is probably a requirement, only hordes can loot this. Just looted this after +- 60 kills, I have a Gonk loa, so just confirming that Pa'ku is not a requirement. just got this to drop from the blood pterrordaxs. didnt take long to get but apparently once you have the egg you can share the quest with people and they will be able to proceed their journey towards raising Kua'fon into the big boi ptterodax he will become. So if you get the egg definitely share it with your guildies. edit: its no longer shareable. sad days. was able to help a bunch of my guildies get it though so its all good. us/oceanic realms add my battletag if you want the quest i will share it. PS it has been fixed. I got one just east of Gloom Hollow in Nazmir. I was 120 and had just come back to finish up the zone quests, and was attacked by a mob while moving towards Nazwatha. I'm sure they're a random low drop chance from any pterrordax, tbch. I don't believe any mystical clicking of the heels, clockwise turns or bat wings are required. Edit: Not sure what the downvote was for, I was merely stating fact. Hello, would be Someone so kind and share it to me? if you get the egg, or someone you know has it and didn't turn in the quest, they can share the quest with you and you get the egg in your bags. Edit: Hotfixed and no longer can be shared. It appears that you are no longer able to share the quest. Just had this drop off of the Bloodrage Pterrordax at Zanchul, west of "The Silver" flight path. I think it took me 30-34 minutes solo. Just dropped this from a Pterrordax Skyrender . Where exactly are the Pterrordax Skyrenders? I am up on the Pterror Rise Rise and all I see are normal Pterrodax mobs. Just had this drop from a Primal Skyterror, found in the Primal Wetlands of Nazmir. Was a surprise that it dropped so soon for me but glad there's other areas besides just Zuldazar! A month of dailies locked behind a 4+ hour grind? Come on Blizzard can you at least pretend to respect our time. Will update when i get it. You can still share this Quest with the people in your group that where there when the Egg dropped for someone, that person can accept the Quest and then trade the Egg to someone else. For now the Egg isn't requiered to Turn-In the quest so everyone can complete it. Edit: As stated on other comments, this has been fixed. This does indeed still drop from Bloodraged Pterrordax and I happened to be blessed by RNGesus with a mere 25 min farm. By the time I at 330 ilevel could finish clearing one run through of the small farming area in The Zocalo, mobs would respawn quickly behind me as they are quest mobs. A 5 man farm group can help for the sake of sustain and efficiency, but prepared to sit tight until you get the drop which auto-starts the quest upon looting. I started the quest yesterday. Today I log in and the little guy isn't there. The troll NPC that stays there says "He ran off, got bored most likely. You should probably go find him before he gets hurt." But idk where to look? At the time of writing this comment the egg is trade-able with other players in the group, making group farm a viable choice. We got our first egg drop and all five of our party got the quest from that and everyone was able to turn in the quest to Pa'ku. We were extremely lucky and got it within 15 minutes. Good luck huntin'! Drop it after 1 hour farming Bloodraged Pterrordax. As long as you were in the party with someone who got the egg at the time of the drop, they can accept the quest then hand the egg over to you to get the quest as well. I started a group and was farming for about 2 hours and noticed 3 people I invited got theirs within 5 minutes of getting to the farm spot. Not chalking this up to just bad rng I proceed to align myself with Pa'ku then went back to farm. Lo and behold got it on my first loot. I do think it you need to be aligned with Pa'ku. I too recommend the farmspot for the Bloodraged Pterrordax especially if you have one or two monks with you, their Black Ox Statue is very valuable. You should try to farm it in an group of 5 people, it makes things much easier because you can trade the egg between all groupmembers if it finally drops for one (everyone can start the questchain with it, you don't actually need to keep the egg in your inventory after you have the quest in your log). And, of course, don't give up! It may have an low chance, but there are far more worse randomdrops ingame. So I finally got my egg to drop today, and recorded all the stats. I farmed the Bloodraged Pterrodax, due to their proximity to Dazar'alor as well as the rapid respawn rate; there will always be some pterrodax's up. In total I took approximately 5 and a half hours and killed 1529 beautiful flying dinosaurs. Not sure why Pa'ku would trust me with one after all that, but I'm not complaining. As far as farms go, this one isn't too bad. You're always active, can quickly get there if you decide to farm for a bit, and over the course of the 5 hours I inadvertently got 4 people to max level skinning. I did drop it after 20-30 minutes from Bloodraged Pterrordax. Confirmed: I would like people to note that you can STILL share the egg if in a group. Each person can get the quest and turn it in. I completed this on 8/26/2018. I am unsure if Blizz will hotfix this. I hope they don't. 2867 Bloodraged Pterrordax kills on my 120 Horde DK, still no sign of the egg. This egg dropped for me tonight from a Feasting Skyscreamer in heroic Atal'Dazar. I was able to trade the egg to others in the party for everyone to receive the quest. Got in in about an hour in group farming. Got lucky since its Super low drop rate. Sharing Quest no longer works Just FYI and you cant trade egg either. It dropped after about 50 Pterrordax kills... Guess I had massive luck. Good Luck to you all. Zanchul is one of the best spots to farm. The bloodraged-pterrordax respawn quite fast, a group should be helpful but soloing isn't bad too. As of today ( 2/9/18 ) the egg IS NOT tradable, so the first few comments in this section are sadly misleading since it has been fixed. Ps: Possibly, it is still tradable if dropped in an instance. Farmed this off of Bloodraged Pterrordax last weekend and this weekend for around 11 hours total. It finally dropped for me this morning and I couldn't be more excited to raise the little guy. Both attempts were on my hunter who has a 340 ilvl and had the Boon of Gonk or the Boon of Bwonsamdi constantly active. Based on the ability to pull these guys non-stop and kill them in great numbers I would say this egg shouldn't be too hard for anyone to get. I feel like I was pretty unlucky but I still ended up getting it in a decent amount of time. The egg dropped for me today after around two hours. One yesterday and one today. Farmed the Bloodraged Pterrordax. I just got it from the rare Kal'draxa in Nazmir. Quest was not up. Just got this of a Young Seaspray while doing Survival Strategy. It still drops from Bloodraged Pterrordax. When running it solo and skinning as I go they respawned in time for me to run a circuit. It took 1024 kills + 300 someodd from some Nazmir ones. This took 5-7 boring hours over 3 days. Don't lose hope. Got a bunch of greens in the process. For all of you using the Rarity Addon. Import this to track your "progress" (In the end it all comes down to random numbers). DISCLAIMER: The chance (1/2450) is based on the averaged wowhead data of all the monsters that drop the egg as per September 24th 2018. The average was made made as no accurate numbers exists because of the relative small number of egg-drops registered by Wowhead. This dropped for me today after 965 kills. I farmed alone the Bloodraged Pterrordax. I farmed the Bloodraged Pterrordax for 10 minutes or so and I very luckily looted the Pterrordax Egg. They respawn extremely fast, so in my opinion, this is the easiest and fastest way to farm for the Pterrordax Egg. Happy hunting! Can you farm the egg in a group with people who already have the egg? Been farming for a long time with a friend, and it doens't seem to drop.. Some of y'all will hate me but maybe I broke the game somehow. I pulled one big group of around seven Bloodraged Pterrordax at around 40.8, 11, got nothing and then killed the one that is attacking an NPC nearby and it dropped. Maybe took four minutes. I feel like I cheated or something. Just farming it in group on Bloodraged Pterrordax and I drop it in 40m. Got this in 10 min farming Bloodraged Pterrordax in Dazar'alor. Got my egg pretty fast in zanchul (also recommend this farm spot). But I come here to say It can drop while you are in Raid Group. While you are w8ing random group for talok+mother M for example, like me. You have nothing actually to do (cos you can't do dailys / caches). So its a one of best way to waste your time in raid with potential benefit. If you still haven't it ofcos. I just learned of this tonight. I guess at some point it was a common drop from the red flying donkeys? Apparently that's not the case anymore... NER#$%E! Hope YOU are having better luck than I am! Can confirm this still drops from the Bloodraged Pterrordax after the Tides of Vengeance patch. Finally dropped for me on 12/13/18 after 2,266 kills. The grind took about 12-14 hours spread out over several days. I received over 100 green items and over 1900 Thick Paleo Steak in addition to the egg. Many of the mobs will evade bug when they exit combat with a troll NPC. Stand directly next to them to remedy this. If you go to ESC > Key Bindings > Targeting > Interact With Mouseover and assign it to a key, you can then leave your mouse hovered over your character and loot by just pressing the assigned key (since the mobs charge you when you attack them, they will always die next to you). This lets you farm without using the mouse at all, and even lets you farm one-handed. It goes faster in a group. There will also be many level ~110 players that wander by from time to time, as the area in question has early BfA quests. Help them and they help you and it's a win-win. Got it today after farming for about 30 mins in a group of 3 ppl. Was able to share the quest with them. This quest/item is now shareable once more! I bought it from someone on my server today and am glad I did as I doubt this will be shareable much longer. Looted this after 996 kills from the Bloodraged Pterrordax in the northern Dazaralor farming area. Sharing the quest works again, and the members of my party were all able to turn the quest in and begin taking care of Kua'fon even though the egg wasn't physically in their bags. Finally after 1457 tries on Bloodraged Pterrordax i got it! Can still confirm u get it there fastest. Just got mine today after a long farm. The comments here may lead you to think that it could take you about 4 hrs of farm to get it to drop. I spent 7-8 hours total. It's great if it drops for you immediately or within the first 40 minutes, but if you start the farm, know that it could take you a long time. Took around six hours farming, but I finally scored a Pterrordax Egg from the Bloodraged Pterrordax in Zanchul. Used Bwonsamdi's buff, and had both Zanchul introduction quests "Pterrortorial Dispute" + "Restraining Order" active for the Gonk buddy system. Best of luck to other farmers out there. Had mine drop from a Bloodraged Pterrordax. Seems like an easy farm, as you don't have to go far for it, and the spawn rate is reasonably fast.